Requiem is told from both Lena’s and Hana’s points of view. The two girls live side by side in a world that divides them until, at last, their stories converge. Hana and Lena childhood friends, now live in two very different worlds. Hana has taken the cure against the disease "love" and lives in the rigidly controlled world, while set to marry the Mayor. Lena has thrown off her chains and lives in the Wilds, free to choose how to feel and act, and has learned firsthand the bitter sting of heartbreak. But both sides are in turmoil as the rebellion brews. The regulators have stopped ignoring those in the Wilds and are now actively seeking out Invalids like Lena. And those Invalids are more determined than ever to fight back. The world will never be the same. REQUIEM is told in point of view rotations between Lena and Hana. I'm honestly not sure how I felt about this as I don't really think Hana's perspective was necessary. Did I mind those sections? No, but I also do not feel like they did much to further the plot as the information gleamed just couldn't stand up in importance to what was going on with Lena. In all honesty I think everything of importance with Hana could have been condensed into a chapter near the end when their stories met. Hana simply could have told her side to Lena, and it would have taken up a whole lot less space. Space that could have been spent focusing on the things that drew me to this series in the first place, the elements of love. Regardless of what "team" readers may be on, I think at the core there needed to be more love in this book. I realize that love as a disease was just used as a way to control the people, but I still wanted to see more of that catalyst in motion. There was just something so magical and captivating in watching Lena learning to love in Delirium, that I felt incredibly bereft at it's loss of focus in REQUIEM. Don't get me wrong, there still is talks of love, especially as Lena struggles to understand the two different directions she's being pulled in. But it seemed to almost stay in the abstract sense, and I just didn't feel consumed by it like I would have wanted. When I finished REQUIEM, I knew I would have to wait a few days before writing this review. That ending really took the wind out of my sales, and I was hoping some time and space would help me be able to review it more objectively. However, here I am a week later, and I can honestly say that my disappointment and frustration has not lessened one bit. 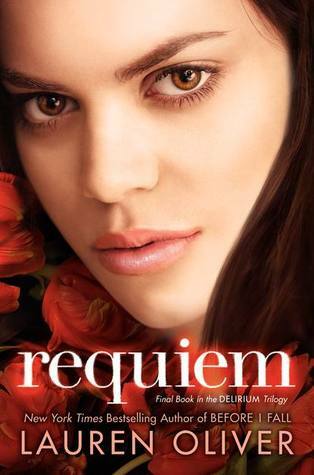 There have been times in the past where the ending of series has left me feeling less than satisfied, but I think REQUIEM may very well just take the cake. I remember reading somewhere that Lauren Oliver was really excited about the unconventional decisions she made. Perhaps those decisions will work for others, but I need at least some semblance of closure to satisfy me. I do not want some overall "message" as an ending, and I certainly don't want the ending book to be a huge tonal departure from the first installment. I want to know what happens to the characters, and what kind of life is coming next for them, and REQUIEM did not provide any of that. Don't get me wrong, I didn't expect everything to end up pretty and happily ever after for the characters, but I did expect to be given more than just a message of tearing down the walls at the end. I'm not one for "cause" books, I read to be entertained. So when you end a series that I've grown to love with only that message about tearing down walls in our lives, I was rather frustrated. In all honestly, it's soured the series for me, which is really a shame as prior to reading REQUIEM, it had been one of my favorite Dystopians. As I look over the other reviews out there for REQUIEM, I realize that my sense of disappointment seems to have put me in the minority. So, I would take my thoughts with a grain of salt, and if you have enjoyed the previous books, chances are this one will work well for you as well. That being said, do I still believe Lauren Oliver is a very talented author? Absolutely. Will I be reading more books from her in the future? You betcha. But as far as REQUIEM goes, I'm just going to chalk this one up to a difference in stylistic preference and move on.